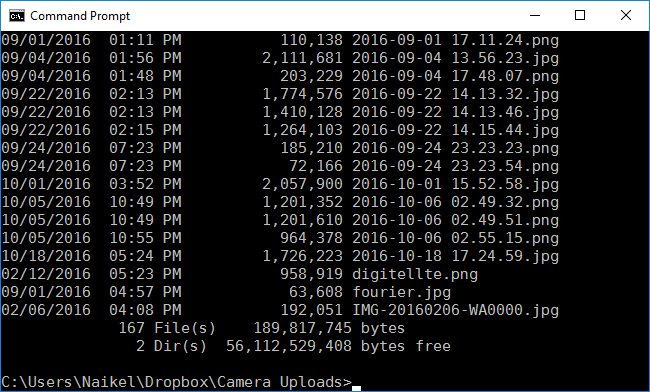 NOTE FOR THE PURISTS OUT THERE: cmd.exe spawns a process called conhost.exe that is the terminal emulator for it. This terminal emulator is what I’m having problems with. I avoided these details on purpose but if you are a purist you’ll be enraged while reading this article. I couldn’t care less. I’m referring cmd.exe as both shell and terminal emulator in this article, with no distinction. ConEmu is a replacement of conhost.exe, but in its default settings, it will be obviously still running cmd.exe. Where the hell my scroll bar go? It was there a minute ago!. I hate cmd.exe. I hate it with a passion. 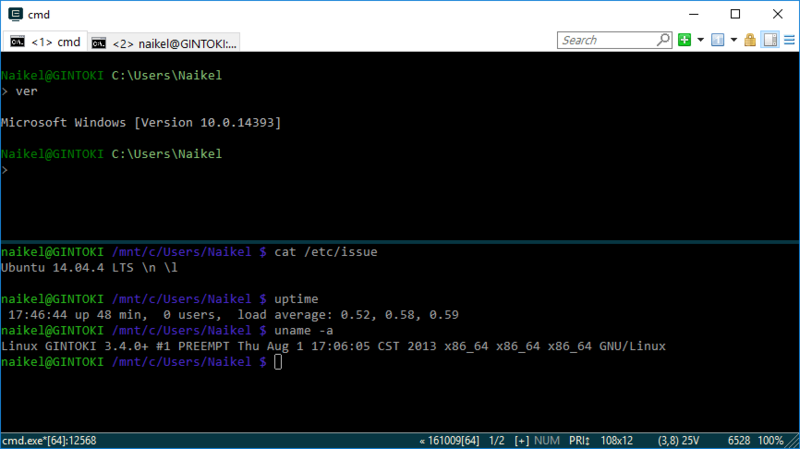 And since you can have Ubuntu Bash on Windows now, I’ve been using the Windows console more. But the problem is that it is totally unusable. So I decided to look for an alternative to cmd.exe and I found this great program called ConEmu. Let’s take a look at some of the best features of this really cool console emulator for Windows. You know how frustrating is to copy/paste in cmd.exe. You have to first right-click the title bar, then select Edit, select Mark and then select a rectangle like if it were a picture instead of text, and then press Enter to copy. It’s crazy. Why did they code it like that? In newer versions of Windows you can right-click anywhere on the window, select Mark and it will select text normally (not a block). Finally you need to press Enter to copy. Even if it’s a little better, it’s still very bad. With ConEmu you just select normally like you do in every other application that has text on it. By default when you release the mouse button the selected text will be auto-copied. You can paste it using the left mouse button or like you always do by pressing Ctrl-V or Shift-Ins. This is especially great since it even discovered the VS 11.0 x86 tools prompt under the SDK menu! Basically, everything that looks like a command prompt is there and you can use ConEmu already as the console emulator for it without configuring anything. You can also add your own tasks selecting the option Setup tasks. You can split your tabs, or tile them, to have them in the same window space. Do this pressing Ctrl-Shift-O to split vertically and Ctrl-Shift-E to split horizontally. 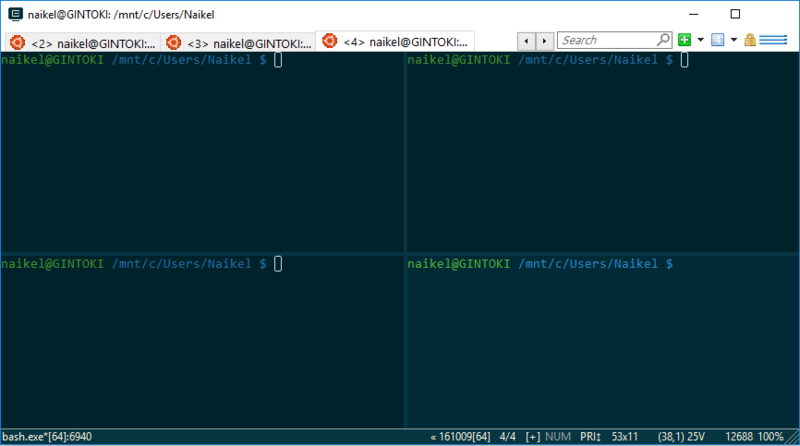 I prefer the traditional tabs one per window space but if you’re into this you can do this. The explorer context menu integration is a must of every single command prompt out there. This is extremely helpful! 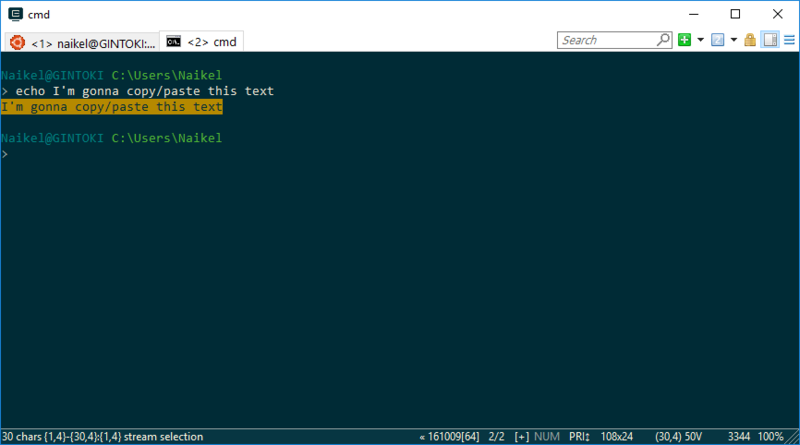 The idea is that when you right-click a folder you get the ConEmu Here option to open a ConEmu window with the working directory being the folder you selected. Finally another great future of this console emulator for Windows is that it has themes that are very gorgeous. ConEmu calls them palettes. Just right-click on the tab you want to change the theme and select View (palettes). There are 32 palettes already defined, and you can modify any one of those to your likes if you go to Settings, Features, Colors. There’s still a lot of features that this console emulator for Windows has that are not covered here, but I have shown you enough to go get this application and install it now. Did you like it? Do you know another really cool feature of ConEmu? Leave a comment below! This entry was posted in Windows and tagged ConEmu, console emulator, windows. Bookmark the permalink.